Octavian Droober orienteers headed up to Cannock Chase to an event organised by Walton Chasers. Gentleshaw Common was the 10th league event for 2016 and club members wanted to make sure that they maintained their winning position. This middle distance race produced some fine runs. On the Light Green 2.9km course Florence Lunn W12 was 1st in 38.56mins, Philip Lunn M45 2nd in 41.41mins, Nathan Chapple M14 3rd in 43.31mins and Leo Morgado M40 5th in 49.58mins. Oliver Flippance M14 was 2nd on the Blue 4.4km course in 37.01mins and Oliver Lunn M14 was 5th in 38.07mins. Keith Willdig M65 was 4th on the Green 3.5km course in 38.38mins. Finley Flippance M12 was 2nd on the Orange 2.4km course taking 33.17mins and Kimberley Lunn W40 was 3rd in 36.27mins. On the short White 1.3km course Tilly Flippance W8 was 3rd in 11.55mins. Running through the National Trust Gardens of Stowe, near Buckingham, was enjoyable amongst the autumn colours on the trees and the many statues and temples. Max Straube-Roth M10 was 3rd on the Short White 1.5km course in 17.43mins and father Daniel Roth M45 was 3rd on the Short Blue 5.4km course in 42.47mins. On the Short Brown 6.3km course Chris McCartney M45 was 8th in 56.46mins and Richard Gardner M60 10th in 59.06mins. Peter Carey M70 was 9th in 41.22mins on the Green 4.6km course. On Saturday, November 12, there will be an event at the ever popular Coombe Country Park, near Brinklow. There will be several different lengths of courses from 2–6km, suitable for beginners and experienced orienteers. with starts from 10.30am until 12noon. Runners and walkers of all ages (5–85 years) and abilities, are welcome to come along to try out this outdoor adventure navigation sport. Help is available to all newcomers. 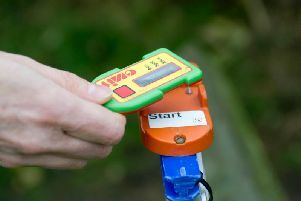 A large scale map and electronic timers are provided; bring a compass if you have one. To find out more see website: www.octavian-droobers.org.